We were masters of nature, masters of the world. We had forgotten everything—death, fatigue, our natural needs. Stronger than cold or hunger, stronger than the shots and the desire to die, condemned and wandering, mere numbers, we were the only men on earth. You'll try to reveal what should remain hidden, you'll try to incite people to learn from the past and rebel, but they will refuse to believe you. They will not listen to you.... You'll possess the truth, you already do; but it's the truth of a madman. Some writings could sometimes, in moments of grace, attain the quality of deeds. And action is the only remedy to indifference, the most insidious danger of all. Since God is, He is to be found in the questions as well as the answers. It is true that not all the victims were Jews. But all the Jews were victims. 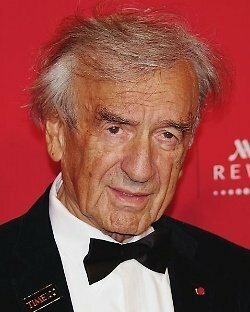 Bio: Eliezer "Elie" Wiesel is a Romanian-born Jewish writer, professor, political activist, Holocaust survivor, and Nobel Laureate.